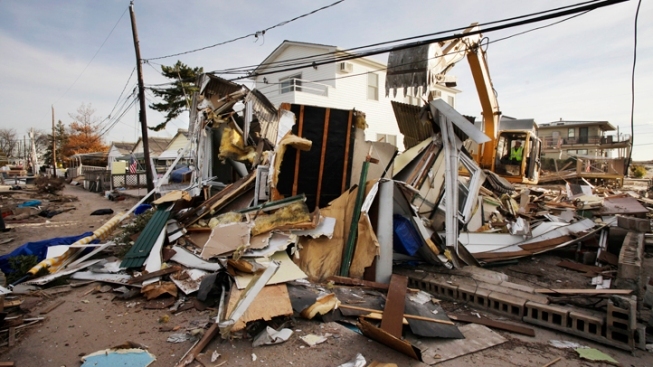 Backhoe operator Keith Henry levels a storm-damaged home in Breezy Point, Queens, Tuesday, Nov. 20, 2012. More than 5,000 New Yorkers will be hired for temporary government jobs cleaning up after Sandy, officials said Sunday. About $27 million in federal Department of Labor money will finance the cleanup and rebuilding positions in New York City and eight nearby counties, paying about $15 per hour and generally lasting about six months, state and federal officials said. Separately, the state and the Federal Emergency Management Agency are working to put New Yorkers into more than 700 temporary FEMA jobs, some as administrative assistants and community relations workers. "This is a neighbors-helping-neighbors effort," state Labor Commissioner Peter Rivera said at a news conference in Red Hook, a Brooklyn neighborhood flooded by Sandy's surge. Gov. Andrew Cuomo called it "a chance to provide young and unemployed New Yorkers with job opportunities cleaning up their communities." The crisis-turned-opportunity message wasn't lost on K'Reese Cole, one of two dozen or more people who lined up after Sunday's announcement to submit applications at a disaster relief center in Red Hook. So far, more than 800 people from across the state have applied, officials said. Cole, who's lived in Red Hook all his 32 years, works various jobs in demolition and construction. "Now I'm trying to work with the cleanup effort out here because we did lose a lot in the community," said Cole, a rapper who also goes by the name Tru Born. Plus, he said, a government job — even a temporary one — could represent a steppingstone to steady work for him and many of his neighbors in Red Hook. The venerable dock and warehouse area includes one of the nation's biggest public housing complexes, along with artists' studios and accoutrements of urban bohemia. Some residents of the public housing development, the Red Hook Houses, were without electricity or heat for about two weeks after the Oct. 29 storm. While the floods have receded and the lights are back on, lingering needs were still visible Sunday in a community where many were struggling before the storm. A block away from the disaster aid center where the jobs announcement was made, members of the Lighthouse Seventh Day Adventist Church set up a table in a park and served free Jamaican-style stew chicken, rice and peas and other dishes. First Elder Dennis McCurchin estimated 500 people were served. Back at the disaster center, Mickey Reid submitted a job application and looked with surprised appreciation at the cluster of officials eager to take it. "The need was here all along," said Reid, 58, a vice president of a tenants' association in the Red Hook Houses. "Since the storm came, these things actually happen now." Job-seekers can apply at a FEMA disaster recovery center, call the state Labor Department at 888-469-7365 or visit http://labor.ny.gov/sandyjobs.